While there are numerous reasons Wisconsin residents have joined the military over the last 150 years—each generation met with unique historical events and changing social expectations—serving one’s country has also been a shared experience within families. Whether a parent and child, siblings, or spouses, serving simultaneously or successively, answering the call to duty through tradition or circumstance, many such families have left their multi-generational stories in the care of our museum. Such is the case of the collection from Orville W. Martin Sr. and Orville W. Martin Jr., a father and son from the Oshkosh area who each gave over thirty years as career officers in the United States Army. 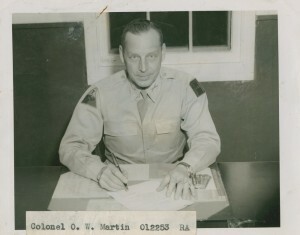 c. 1944 photograph of recently-promoted Colonel Orville W. Martin Sr., Division Artillery Commander of the 7th Armored Division. Orville W. Martin Sr.—better known as “Doc”—was born in Neenah, Wisconsin in 1897. 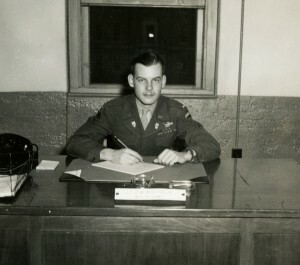 He began his studies at the United States Military Academy at West Point in 1917, although World War I quickly intervened, leaving Martin to serve as a field artillery officer in Germany before completing his education. Following his 1919 graduation, he returned overseas for an influential tour of the battlefields of Europe. This experience gave him a great personal interest in the history of the war and its landscape, knowledge that would prove useful later in his career. In 1920, Doc joined the 24th Field Artillery stationed in the Philippines. It was here he met his future wife Priscilla, the sister of one of his fellow officers. They married in 1922, and moved back to Oshkosh the next year ahead of the birth of their first and only child, Orville W. “Sonny” Martin Jr.
Doc’s career moved them all around the country during Sonny’s youth. The younger Martin described post life during a 1995 oral history interview as happy and well adjusted. Clearly, it was also influential, as it became apparent in his teens that he would follow in his father’s footsteps. His father had already included Sonny in base maneuvers since he was twelve, letting him dress in uniform and drive teams of horses right along with the troops. His father also sent him to radio school, made him learn to lay wire, and of particular future use, helped him become proficient in map reading. While Doc attended Command General Staff School in Baton Rouge in 1940, world events again intervened. He was sent to Fort Knox, training grounds for the 7th Cavalry Brigade (Mechanized)—the Army’s first mechanized unit—to be one of the first to implement tactics in the new field of armored field artillery. Major Martin was given command of the 68th Field Artillery Battalion in 1941, and was sent to North Africa the following year with the 1st Armored Division. 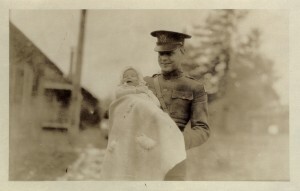 This January 1924 postcard labeled “Junior’s Smile” shows Doc and Sonny while in Fort Lewis, Washington. Early in 1943, the elder Martin was injured during the attack on Sened Station in Tunisia, taking shrapnel in both his leg and arm. The March 15, 1943 issue of Life featured a full page image of the wounded Martin, arm in sling, on his way back to Fort Knox. Following his recovery at Fort Knox, now-Colonel Martin was put in command of the 7th Armored Division Artillery. He arrived in England in June of 1944, was sent to France that August, and found his division redirected to the Netherlands before ultimately being ordered to St. Vith, Belgium on December 16th, the commencement of the Battle of the Bulge. Here, the 7th significantly slowed the German advance for a week before being forced to withdraw. Eventually, they would regain St. Vith before redirecting their efforts toward the fall of the remaining German resistance within the Ruhr Pocket. Lt. Martin strikes a pose similar to his father’s while the Aide-de-camp to Brigadier General Kurtz, April 1946. At the same time, the younger Martin was preparing for his own deployment to Europe. Having completed Armor School in December 1943, 2nd Lieutenant Martin headed to Camp Bowie, Texas with the 13th Armored Division to assist in battle training. In April 1944, the 13th was suddenly stripped of the majority of their lower ranks. Sonny recalled being reassured despite this action by a speech from General George C. Marshall, who stated “I can’t tell you what or exactly why, but you are very soon going … to be very proud of the men you trained and of the contribution that you have made toward the war.” Unbeknownst to them then, their troops were separated in order to participate in the Normandy Invasion, a testament to the superior training of the 13th despite being a newer armored division. This was not the only commentary on the war the father and son shared. Sonny described Doc’s appreciation of the 13th’s troops during a visit in Bavaria in May of 1945, explaining “… my father came down from Halle [Germany] where he was Division Artillery Commander… he said, ‘You know I could darn near have cried…I’ve talked to some of your soldiers and some of yours in the Battalion here…these people could have been officers in the 7th Armored Division… they’re better material than some of the officers we had who were good combat officers—it showed, you know, the caliber of people.” It was high praise indeed coming from a man with over 25 years of experience in the Army. The elder Martin returned stateside that year, and eventually retired as a Colonel from the Army in 1950, having been decorated by three European nations as well as the recipient of two Silver Stars, the Legion of Merit, three Bronze Stars, the Purple Heart and the French Croix de Guerre with Palm. Sonny remained in Germany with the Constabulary force until 1949. He went on to serve in Korea and Taiwan, and worked at the Pentagon before becoming the Editor in Chief of Armor Magazine. He retired, also as a Colonel, in 1974, having been awarded the Legion of Merit, two Bronze Stars, the Meritorious Service Medal, three Army Commendation Medals, and the French Croix de Guerre.